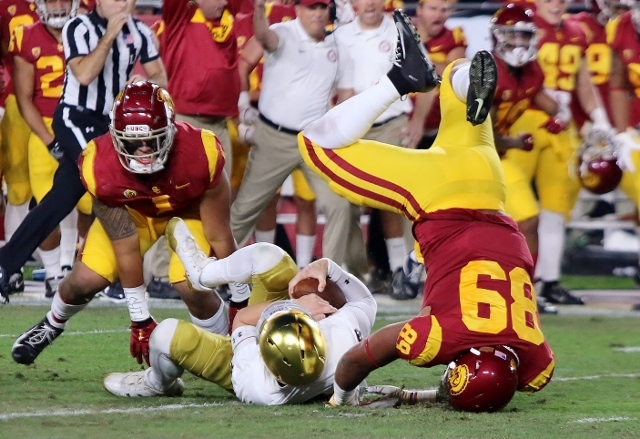 (Los Angeles) – USC, as has been a pattern this year, jumped out to a 10-0 first quarter lead but it didn’t hold up in a 24-17 loss to Notre Dame Saturday night at the LA Memorial Coliseum. The Trojans took the opening possession and marched 78 yards on eight plays. Vavae Malepeai capped it off with a 14-yard touchdown run. Notre Dame moved the ball out to the 49 yard line on its first series but was forced to punt from there. USC receiver Michael Pittman fumbled on the next series and Notre Dame’s Troy Pride fell on it at the Irish 33. Notre Dame was unable to generate any offense however and punted the ball away. 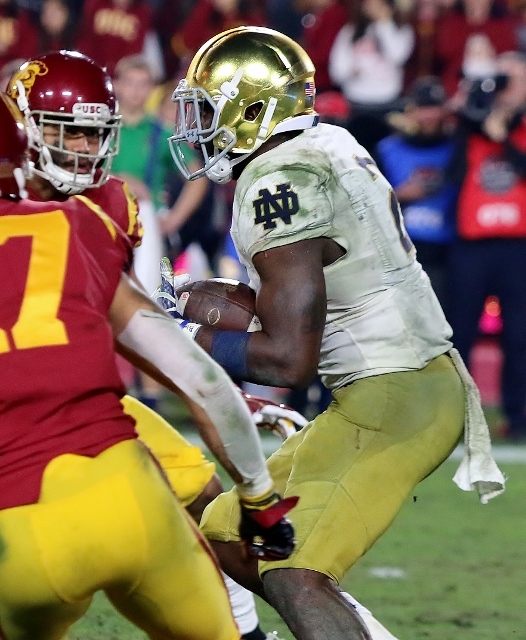 USC marched down to the Notre Dame 14 before the drive stalled but Michael Brown kicked a 30-yard field goal early in the second quarter for a 10-0 lead. Later in the quarter Notre Dame pieced together an 11-play, 64-yard drive to get on the board. Ian Book hit Chris Finke on a 23-yard touchdown pass to cut the Trojans lead to 10-7 with 2:20 left in the first half. With 1:00 left in the first half JT Daniels hit Amon-Ra St. Brown who made the catch but then fumbled at the Notre Dame 15 yard line. Drue Tranquill made the recovery for the Irish to stop drive and keep the USC lead at three. Book completed a pass to Miles Boykin down to the three yard line as the first half clock ran out and the Trojans took the 10-7 lead into the break. Daniels was 26 of 31 for 244 yards at the half. Tyler Vaughns had 10 receptions for 72 yards and St. Brown eight for 82. For Notre Dame Book completed 14 of 21 for 178 yards and a touchdown. Notre Dame came out of the gate fast in the third quarter needing just two plays to go 67 yards on its first possession. Dexter Williams broke free for a 52-yard touchdown run to give the Irish their first lead of the game at 14-10 with 10:55 left in the quarter. Justin Yoon booted a 46 yard field goal with 1:07 left in the third quarter half to give the Irish a 17-10 advantage. USC’s Jordan McMillan intercepted Book in the endzone to stifle a Notre Dame threat with 7:54 left in the fourth quarter. But USC failed to get anything going and punted the ball away from its own 12 yard line. Notre Dame cashed in when Book hit Tony Jones on a screen pass in the flat and Jones did the rest sprinting 51 yards for a touchdown to make it 24-10 with 3:09 left. 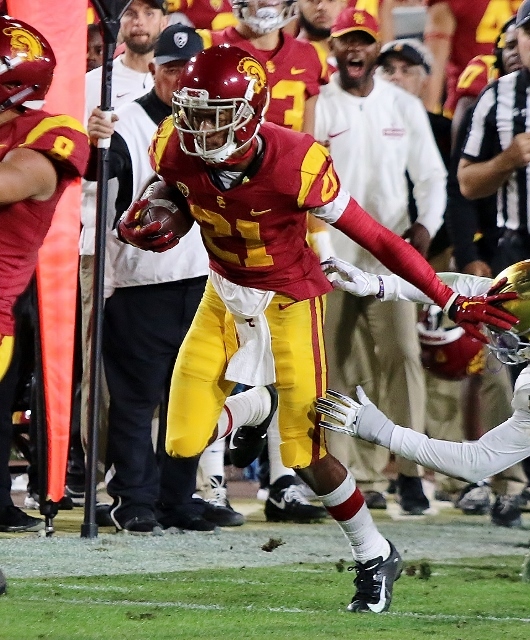 USC had one last murmur of protect when Daniels hit Tyler Vaughns with a 20-yard touchdown strike with 48 seconds left. The Trojans only hope at that point was to recover the onside kick but the Irish fell on it to seal the victory. Daniels finished with 37 of 51 completions for 349 yards and a touchdown. Vaughns had 10 catches for 120 yards and the touchdown and St. Brown and Michael Pittman each had over 90 yards in receptions but it wasn’t enough. The Trojans had only 94 yards rushing. For Notre Dame Book was 22 of 39 for 352 yards, two touchdowns and an interception. Notre Dame came into the game ranked third in the College Football playoff rankings and improved to a perfect 12-0 with the victory. USC is now making off season plans. The Trojans are not bowl eligible and ended the season with three straight losses and a 5-7 record. 3 Comments to "USC Can’t Spoil Perfect Irish Season"
This photo represents USC’s season perfectly. Upside down landing on your head. Helton made promises of playing time to too many incoming recruits. Can’t risk losing them by firing Helton. He will be gone after game 2 next year. Allow me to modify my statement to say that, with his announcement of Helton’s retention as head coach of a program in shambles, it’s more likely that Lynn Swan’s head will roll first. There was the slightest hope of Helton hanging around if he had been able to best the Irish. With this loss, however, the man is absolute toast.